Detective Gordon finds himself on the trail of a drug ring which runs through the core of Gotham City Police Department. Will he be able to bring it down or will his continued attempts to root out corruption in the police force yet again fail? Meanwhile the fallout from last week’s episode finds Penguin in charge of Fish’s club and Fish being menaced by Falcone’s torturer. 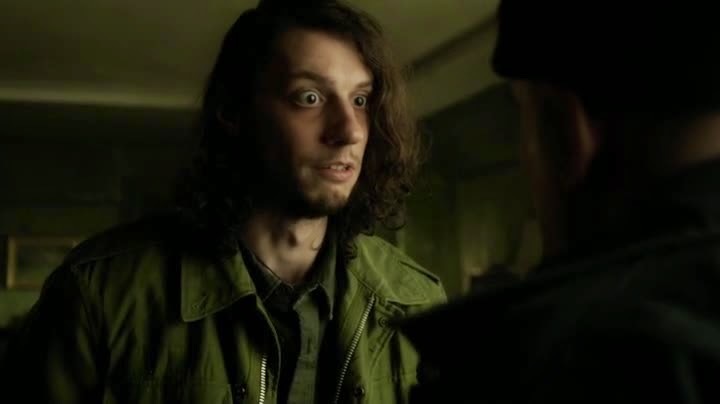 So this episode of 'Gotham' is pretty unpleasant. 'Gotham’s' tone is somewhat inconsistent at the best of times, with some episodes being notably more violent than others. 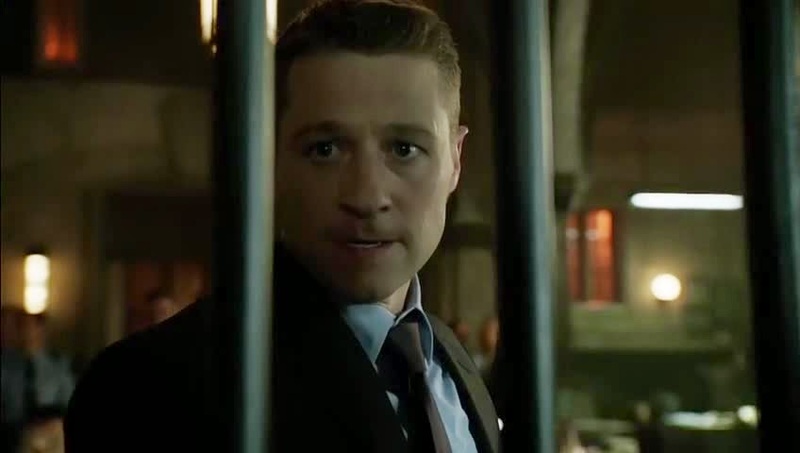 ‘Welcome Back, Jim Gordon’ has a lot of brutal, realistic violence in it. Weirdly 'Gotham' seems to hang primarily at a teenage drama level of ‘young adult’ content. It occasionally seems to swing into noticeably more adult territory. Ideally a tonal middle ground would be best for ‘Gotham’, the more extreme violence feels out of place when the episodes in question also feature younger characters such as Bruce Wayne. So Jim Gordon goes after corrupt officers in the police force, again. Although well handled the police drug ring plot feels like a re-tread of earlier episodes. Gordon won’t let the status quo stand and finds himself under pressure from his fellow officers. Entire scenes seem to have been lifted from earlier scripts. This includes Gordon “making a statement” by locking up a police officer in the novelty cell they keep in the centre of the GCPD, much to the chagrin of his fellow colleagues. As I said this police corruption plot feels as if it is being handled with a bit more care in this episode, I just wish it could handle it with a couple of new ideas thrown in also. The Fish Mooney plot is handled very well. Much of the episode shows her traveling with Butch as her protector, having lost the rest of her employers. These scenes are nice but they feel a bit lacking dramatically. 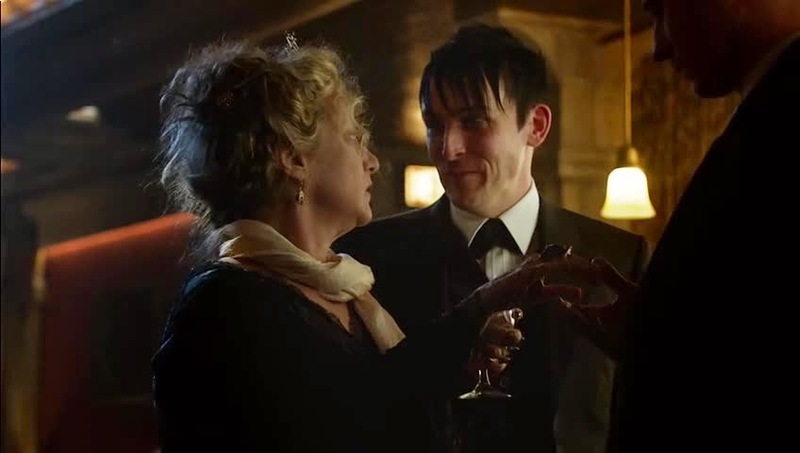 I’ve never felt that Fish and Butch have as good chemistry as ‘Gotham’ seems to think that they do. The scenes with Oswald and his mother conversely are very strong, with the pair of them coming across as a genuine mother and son. 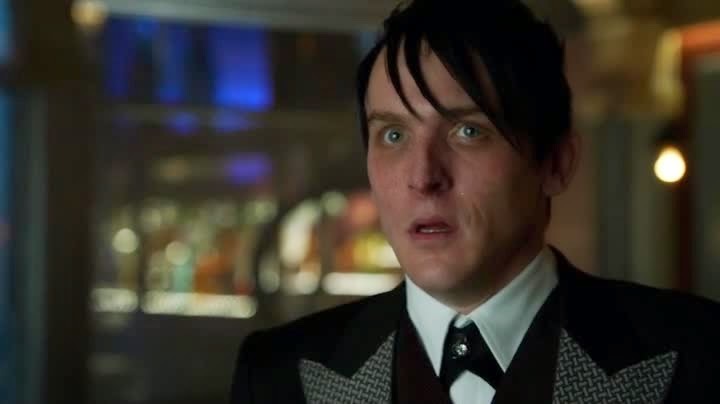 Any scene which shows the more childlike side of The Penguin is a plus in my book, hopefully we will get more family moments as the show continues. Although I suspect that this strong relationship is being set-up for motivational character tragedy later. 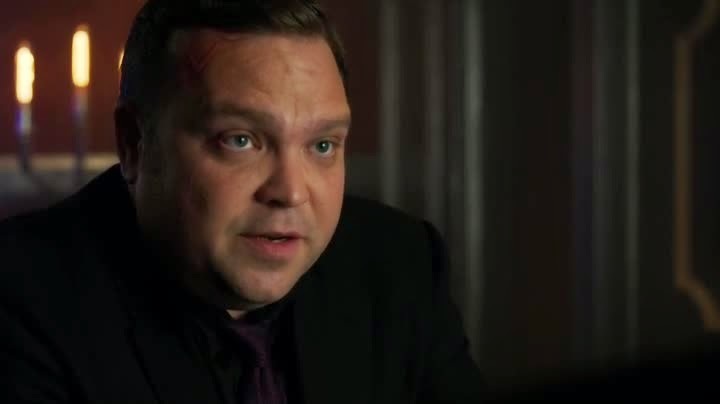 So ‘Gotham’ seems to be getting better at balancing out the multiple strands of its story. Although primarily dealing with the Gordon/Mooney plots, this episode also manages to throw in other characters without undermining itself. In this episode we get a continuation of both the Bruce/Selina relationship and that of Edward Nigma/Kristen Kringle. These diversions do not feel entirely linked to the episode thematically and don’t add much to it but they don’t take away from it either. It would be fair to say that ‘Welcome Back, Jim Gordon’ is not one of the strongest episodes of ‘Gotham’, but it is very competent. To call it competent is not a knock against it however. ‘Gotham’ has been enjoyable before in-spite of itself, succeeding sporadically against self-imposed problems. A feeling of professional consistency seems to be finally coming to ‘Gotham’. With the correct support structure in place, ‘Gotham’ should go from strength to strength…. I’ve jinxed the next episode by saying that haven’t I? A spate of bank robberies have managed to shock Gotham City out of its crime induced coma of indifference. What is it about these robberies that has grabbed their attention, where so many before haven’t? 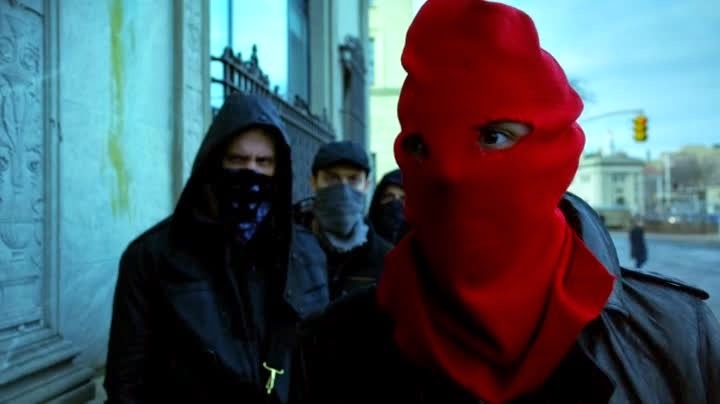 A red hood, a seemingly simple piece of fabric worn by the lead robber has changed the entire attitude of the city. More shockingly is the effect it has on those who wear it, are they as invincible as they feel while wearing it, if so how will Jim and Harvey stop them? Meanwhile a friend from Alfred’s past has come to visit him at Wayne Manor but is Alfred really ready to take a walk down memory lane? So this episode came with a certain amount of expectation. The Red Hood is an infamous part of Batman lore, particularly due to his connections with the Joker. This and the previous episode have made subtle and not so subtle references towards the joker. It’s clear that ‘Gotham’ is building up to the appearance of the Joker and is laying the ground work in the audiences mind for his premiere performance. Although this excitement is being built quite nicely it has the unfortunate side effect of removing all Joker based tension from the episodes. We as an audience know that the Joker is going to be the season finale villain, he’s too important to be anything else. Therefore every failed stand- up comedian and red hood obsessed villain in the meantime is going to be a red herring. ‘Gotham’s’ formulaic and generic ‘TV’ nature is a severe problem, probably the biggest the show has. We know how television works so we know how ‘Gotham’ works. This is particularly bad since the show is pretty well written, it just feels the need to use established conventions as a framework to build off. The majority of episodes being a crime procedural and all, end with a ‘shocking’ twist revelation. We are not meant to predict the outcome, who the killer is. The fact that ‘Gotham’ is well written now means I can watch it and work out what the most dramatically satisfying twist ending would be, thus predicting it and ruining the surprise almost every time. It’s a shame because the twists are well written but the reliance on having one every episode complete undermines the concept. So as I suggested this episode is really well written. The stuff with the Red Hood gang is nicely handled and feels completely at home within both the universe of Batman and the world of ‘Gotham’. The gang members are nicely rounded out and feel like genuine people. The nature and concept of the red hood itself is also very interesting. The gang seem to believe that it gives them super powers and this makes them exceptional versions of themselves in the process. The episode purposefully leaves it open to interpretation if the mask does itself grant powers, as if it were cursed or if it is only magical in the minds of those who wear it. Alfred’s friend Reggie from ‘Her Majesties Special Air Service’ is an interesting character and forces the darker past of Alfred to the service. His influence on the relationship of Alfred and Bruce is very interesting. They both get to meet the alternate version of Alfred, the one who hit rock bottom, the Alfred who never met Bruce. 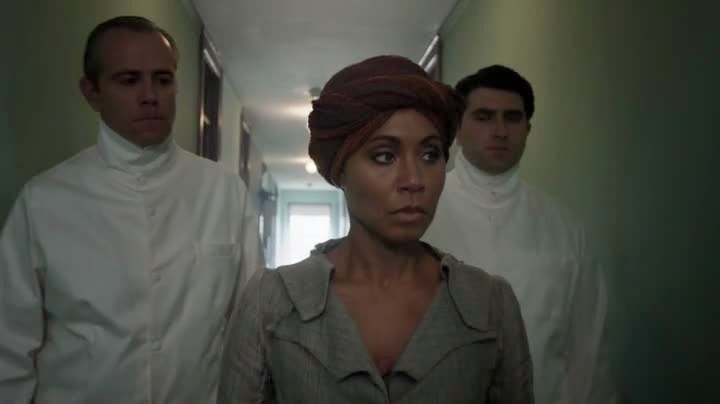 Fish Mooney continues to feel limp and somewhat pointless in the show. Her scenes now seem to be used primarily for shock value. It seems a shame that she left Gotham City alive in the first place. I suspect that having the character go out when Falcone discovered her plans would have left her with more dignity than she has now. I suspect she will return before the end of the series and maybe the showrunners have a grand plan I’m missing. It would have to be pretty darn incredible to excuse this listless set up however. The scenes with Penguin are nice this week. He has been forcibly teamed up with the reconditioned Butch to help him restore the success of the bar. These scenes are interesting because they team up the two great manipulators of the show and play them off each other. 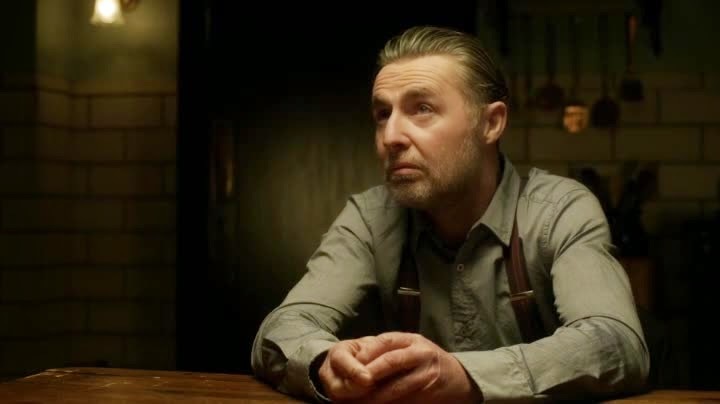 I have a horrible feeling that ‘Gotham’ will do the obvious effective thing and have Butch become his old self again at the most dramatic moment. I quite like this darker Butch however and hope that his ‘friendship’ with the penguin will long continue. It feels as if the Penguin has met his match at last and this could be the beginning of a beautiful friendship. So I liked this episode a lot. It seems that ‘Gotham’ has been trying a new direction these last few episodes, it feels considerably more grown up. We still have parts that seem as ridiculously ‘Gotham’ as ever, such as Fish’s adventures in the cartoonish-ly evil organ farm but for the most part the show feels smarter. It’s clear that ‘Gotham’ is taking influence from other modern television shows such as ‘Game of Thrones’ and ‘Elementary’. Given that most episodes of ‘Gotham’ feels as if the most recent show the writers watched was ‘Murder She Wrote’ repeats, this new influx of modern and less conventional television is very encouraging to see. Maybe ‘Gotham’ has made itself a red hood to wear; one that the writers wear to makes themselves feel more confident? We can only hope. Jim and Leslie’s date at the circus is interrupted when the two rival families of the circus break into a fight during the show. It turns out that Lila, a snake dancer at the circus, has been murdered and the Lloyds and the Graysons each blame the other for her death. Will the mysterious circus psychic be able to help the GCPD solve the case? 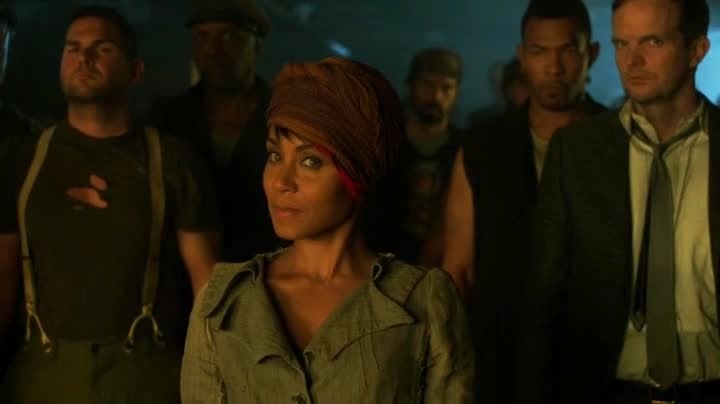 Meanwhile, Fish Mooney has devised a scheme to find out who is running the prison that she is trapped in and Bruce Wayne has decided to confront the Wayne Enterprises board of directors. So Gotham has realised that to have a city that feels truly entrenched in corruption you need to show that it has a dark past. Tim Burton, with both ‘Batman’ and ‘Batman Returns’ captured the feeling of a city that has an ancient, by American standards at least, history of corruption and crime. This episode feels very heavily influenced by those films. Where previously Gotham felt very modern and the crimes felt like a topping on an otherwise normal city, we now have a city which has had a long history of warring clown families and satanic cults. We have had a look into the past of the city before, such as in ‘Spirit of the Goat’ and these glances into the history of the city really add another dimension to the show. The original premise of the show promised that it would follow the crime families of Gotham, crime families that had long and interesting dynasties that influenced them. It is nice to see some of this aspect make its way into the current, slightly bland, iteration of the show. How ‘Gotham’ messed up was to forget that a character with a dark past is an interesting character study and not a way to get cheap shocks. It also seemed to forget that weed and lady-on-lady action isn’t very shocking in 2015, not unless you’re an aging network executive. This new Barbara seems stronger, darker in some ways and we are getting subtle hints of the person she truly is. We feel sorry for her because she is trying to be normal when she isn’t. This is something that she shares with her two new friends and more importantly something tangible we can empathise with. In addition to these character moments that pretty much redefine Barbara we get some nice moments which play off the relationships we have formed with the cast. Oswald for example is having trouble running his club, we see that at his first actual opportunity of true power he can’t cope and fails. The Penguin is a villain who should always be the second in command but his wish to be the King, or Emperor if you will, leads to his downfall. We have spent weeks watching Oswald survive by the skin of his teeth, barely making it through alive. We know that he isn’t quite good enough, even if he won’t accept it and these moments that prove us right are really rewarding to the audience. We also see Fish’s coup at the organ factory begin to play out. Fish takes over the situation in only the way she would, brutally. These scenes are effective but the character of Fish still feels like a fish out of water since she left Gotham City. I would say no amount of smart writing will make her relevant again but I had also written off Barbara Kean, so we shall see. 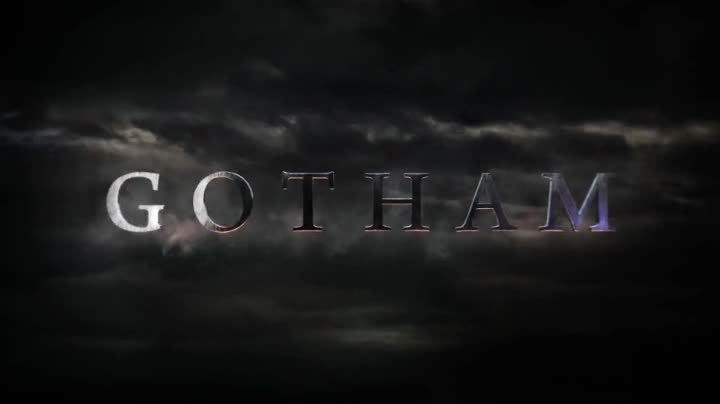 So this is a pretty good episode of ‘Gotham’, not earth shattering but pretty good. I’d like to say, love to say actually, that the improvements shown in this episode towards the history of the city and its inhabitants would continue in future episodes but I can’t. ‘Gotham’ can go from being amazing television one week to being borderline unwatchable the next, it’s incredibly inconsistent. That being said the rebooting of Barbara feels like a very deliberate attempt to fix her character. If the creators of the show have started listening to criticisms maybe they have made a list of things to fix and intend to rectify them. I can’t tell for sure, I’m no psychic.